Rising water demands and diminishing water supplies are exacerbating water scarcity in most world regions. Conventional approaches relying on rainfall and river runoff in water scarce areas are no longer sufficient to meet human demands. Unconventional water resources, such as desalinated water, are expected to play a key role in narrowing the water demand-supply gap. 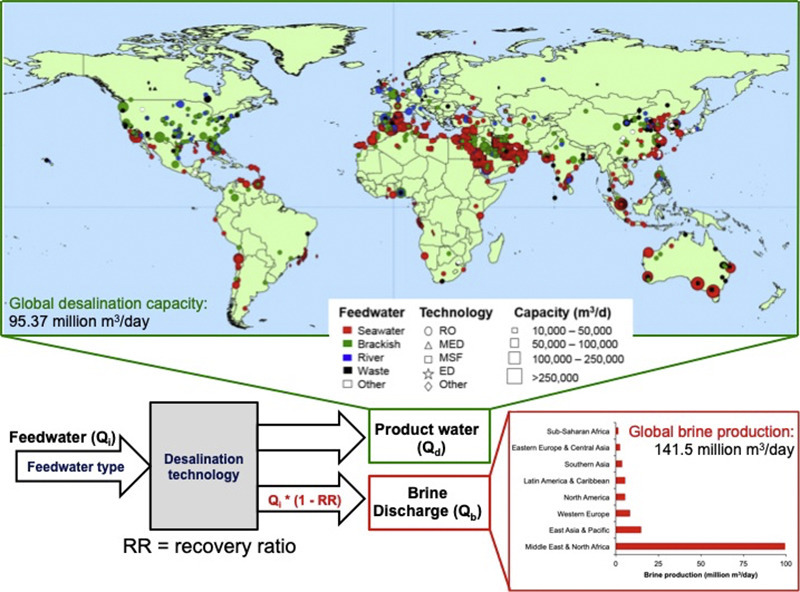 Our synthesis of desalination data suggests that there are 15,906 operational desalination plants producing around 95 million m3/day of desalinated water for human use, of which 48% is produced in the Middle East and North Africa region. 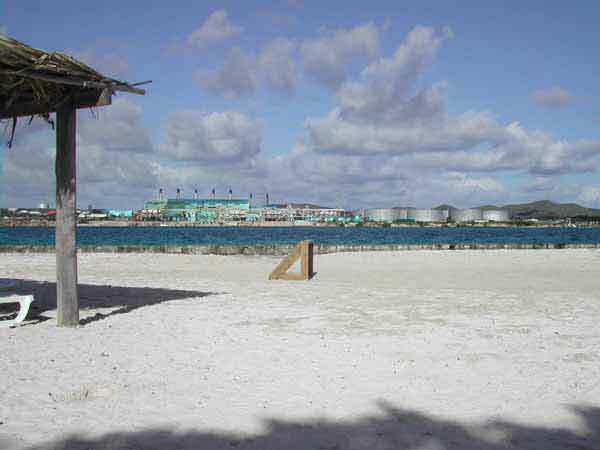 A major challenge associated with desalination technologies is the production of a typically hypersaline concentrate (termed ‘brine’) discharge that requires disposal, which is both costly and associated with negative environmental impacts. Our estimates reveal brine production to be around 142 million m3/day, approximately 50% greater than previous quantifications. Brine production in Saudi Arabia, UAE, Kuwait and Qatar accounts for 55% of the total global share. Improved brine management strategies are required to limit the negative environmental impacts and reduce the economic cost of disposal, thereby stimulating further developments in desalination facilities to safeguard water supplies for current and future generations. The Bureau of Reclamation has announced the availability of funding for research and laboratory studies, pilot scale projects, and demonstration scale projects in desalination and water purification. Reclamation anticipates awarding a total of up to $1 million under this funding opportunity announcement. The funding is being made available by the Desalination and Water Purification Research and Development Program. Through this program, Reclamation is partnering with private industry, universities, water utilities, and others to address a broad range of desalting and water purification needs. The program has three major goals. The first goal is to augment the supply of usable water in the United States. Second, it is to understand the environmental impacts of desalination and develop approaches to minimize these impacts relative to other water supply alternatives. The third goal is to develop approaches to lower the financial costs of desalination so that it is an attractive option relative to other alternatives in locations where traditional sources of water are inadequate. Eligible applicants that may submit proposals include individuals, institutions of higher education, commercial or industrial organizations, private entities, state and local governments, and Indian tribal governments. Foreign entities, other than the United States-Mexico binational research foundations and inter-university research programs established by the two countries, are not eligible for funding. Reclamation will make up to $150,000 available for each research and laboratory study for a duration of 13 month, $200,000 a year for each pilot scale project for a duration of up to 25 months, and $500,000 a year for each demonstration scale project for a duration of up to 37 months. The Desalination and Water Purification Research and Development Grant Funding Opportunity, posted on May 21 at grants.gov, can be found by searching Funding Opportunity Number R10SF80251. The deadline for applications is Tuesday, July 7, 2010 at 3:00 p.m. MDT. It is anticipated that awards will be made in September 2010, with an anticipated project start date on or around October 1, 2010.